Christmas Window is three patterns in one. 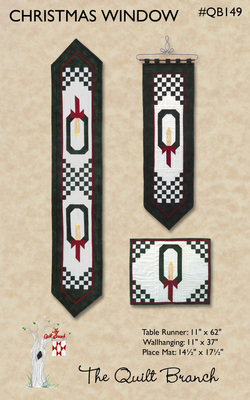 First up is the long and narrow table runner - great for your table, your buffet or your sofa table. Then the generous sized 14" x 17" placemats will add to any holiday dinner. The wall hanging can fit perfectly in the narrow space by your front door or a hallway. Any one of these quilted projects would be a perfect gift for you or a loved one.